I love brunch. Possibly the most millennial statement I could foreseeably make, but, as I am both a foodie and a millennial – and, as such, a foodie on a budget – it’s one that I feel comfortable standing by. One of the great discoveries of last year for me, partly, though not entirely, a product of both working shifts and giving up alcohol for several months was the joy of brunch dates. There are specialist places now – a bit hipster, but my goodness the food is great – which makes the whole process feel more like a treat and less like an apology for all involved. A great deal of my foodie-ness is a product of learning self-care as a student – I do a great deal of bulk cooking both because it works out cheaper and also because it makes my life easier in the future. But there are few greater joys for me when I have a day to myself or even just a free morning, than putting together a really nice breakfast or brunch. 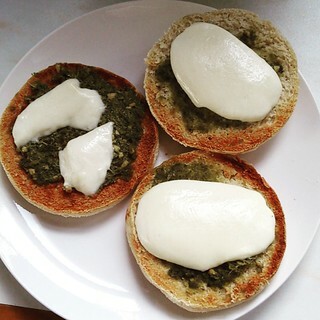 In summer I love to make my own yoghurt and find all kinds of tasty and adventurous ways to use it up. 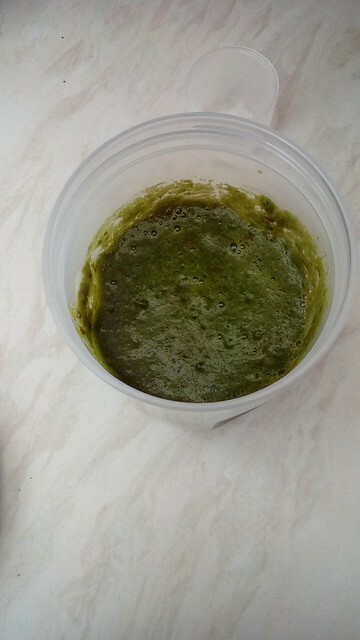 My favourite being to make my own little compote pots, gently cooking some summer fruits and berries with a little ginger, toasting some oats and flaked almonds and perhaps adding some to a smoothie that needs thickened up a little. I must confess that when I was younger I always thought that muffins – the American style muffins, not the English ones, those have always been in the category of ‘posh toast’ for me – were too sweet for breakfast. However, once I learned to make my own there was no stopping me. 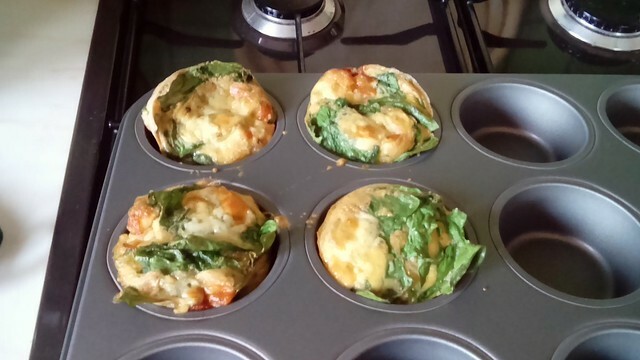 The fact that the second variety of muffins I successfully pulled off were savoury – spinach and three cheese muffins are things of glory, especially if you perk them up in the microwave for 30 seconds before eating – undoubtedly helped. 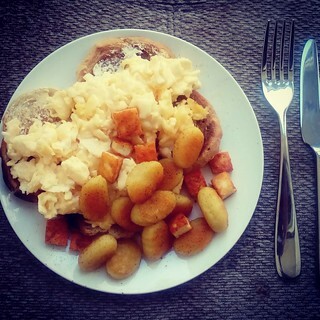 However, it’s in winter – especially wintery Sunday mornings – that I make the truly decadent brunches. Egg-heavy cooked breakfasts have always been associated with Sundays for me. 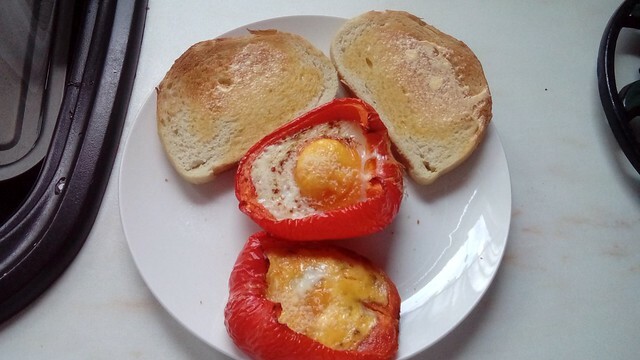 When I was a kid, my dad used to make brunch for us on Sunday mornings and all his brunch recipes involved eggs. (Looking back on it, this was probably largely because we kept our own chickens and if you have plenty of fresh free-range eggs at your disposal, why on earth wouldn’t you?) And what I wouldn’t give to figure out his old ‘toad-in-a-hole’ recipe that he hasn’t made since I was in single digits and therefore can’t remember how he did it. Even in my earliest student days when I barely cooked at all, on a Friday morning, when we’d all been out the night before, I would gather up all the left-over eggs and bread and make French Toast for anyone that wanted it. Cooking eggs for breakfast will always be an act of care and indulgence. One of the first pieces of kitchen equipment I bought myself after I moved to Inverness was a small omelette pan. It felt like a ridiculously indulgent purchase at the time, but it’s proved surprisingly useful for a variety of things – my other frying pan is a large heavy-duty, oven-safe frying pan – and is the perfect size to make a one-person omelette. Mastering the art of a good omelette and eggs scrambled exactly to my liking were both moments – years apart though they were – that felt weirdly like milestones of adulthood. An awful lot of fancy brunch recipes have the unfortunate tendency to revolve around either salmon – I didn’t eat fish even before I was a vegetarian – or avocados – I like guacamole just fine, but getting ripe avocados here is more trouble than its worth – so I when I find a fancy egg based brunch recipe it is a thing of joy. Eggs in purgatory are decadence personified, but really needs a friend to make cooking it worthwhile. 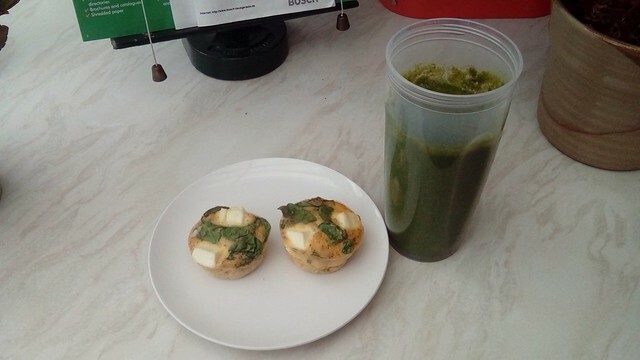 Baked eggs in halved peppers are a slightly precarious but ultimately delicious proposition, while spinach, feta and egg muffins are decadently glorious. 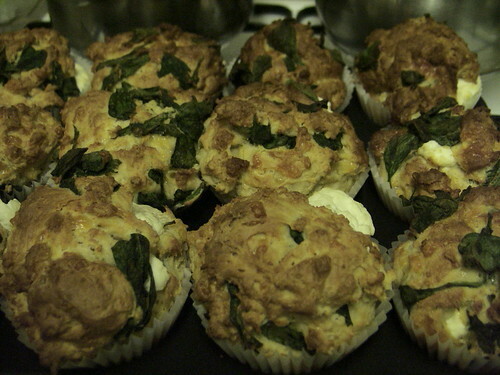 Even just treating myself to some soda bread or cheese muffins to toast, butter lightly and serve with scrambled eggs is somehow soothing to the sole. And frankly adding a little paprika to most things makes everything feel that bit classier. I do sometimes make brunches that don’t involve eggs. I don’t often make my own (English) muffins, or my own lemon curd, but when I have both on hand there are few greater joys. I’ve never quite mastered making my own crepes, so I prefer to leave those to the professionals, but nonetheless I’ve had some fun trying! Just the other day I made what I insist on calling ‘posh cheese on toast’ where you toast some fancy bread (a nice roll, soda farl or muffin halved is particularly good for this) under the grill, then spread with either tomato paste or pesto, and then layer on some nice cheese (those slices of smoked cheese are the perfect size, but any cheese with a low-ish melting point will work, mozzarella is good if you’re in a hurry and/or really hungry) and stick it back under the grill to melt. If you’re feeling fancy you can put a couple of cherry tomatoes on the side or a sprig of parsley on top. 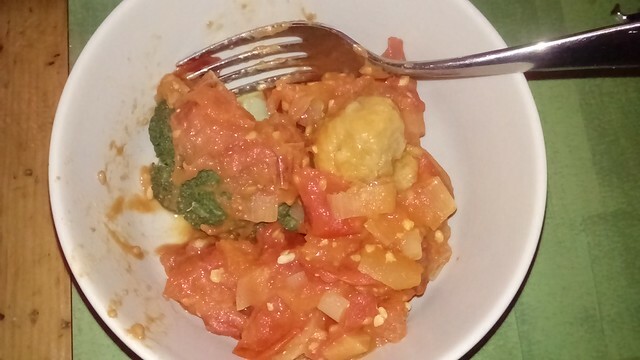 While this morning, I made my own take on breakfast burritos, a recipe I concocted out of what I happened to have in my fridge and freezer one Saturday morning, when I needed something reasonably substantial and was distressingly out of eggs. I know that for some people waffles are sweet things, but for me the default setting of waffles is potato, and I like to keep emergency waffles in the freezer – normally the mini ones for both space and versatility reasons. 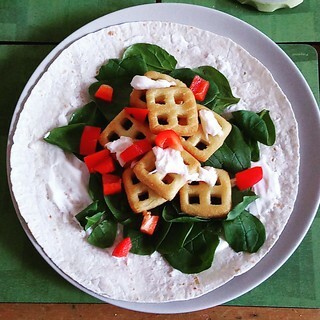 So my breakfast burrito consists of the following, cook half a dozen mini waffles by your preferred method, take one soft flour tortilla and warm lightly, then spread with sour cream, prep a handful of spinach and arrange on the tortilla. Once the waffles are cooked pile them on top of the spinach and sprinkle over whatever cheese you have to hand, and stick the whole thing back in the – now off, but still warm – oven or under the grill for a minute to let the cheese melt. Fold the whole thing up like a burrito and voila! Breakfast of champions! I had some chopped red pepper left over from dinner last night, so I sprinkled them over the waffles too, and they added a delightful crunch. You can replace the sour cream with cream cheese if that’s what you have in the fridge, but I made a big pot of chilli last week so sour cream it was. There’s just something about having made myself an excellent brunch that sets me up right to have a productive weekend, like a big comforting hug in food form. A reassurance, that no matter what else I may or may not manage to achieve over the weekend; one thing at least has been a complete success.